France in London | Do you know BedZED ? Do you know BedZED ? My first reaction upon hearing that I was to visit BedZED's 'sustainable community' was scepticism. This combined with my embarrassingly poor knowledge of architecture left me with a rather confused notion of what I was about to see. Would it be a collection of wooden huts in which all polluting human activities were prohibited (ie : back to prehistoric life). Or would it be an ultra-modern and utopian architect's fantasies ? 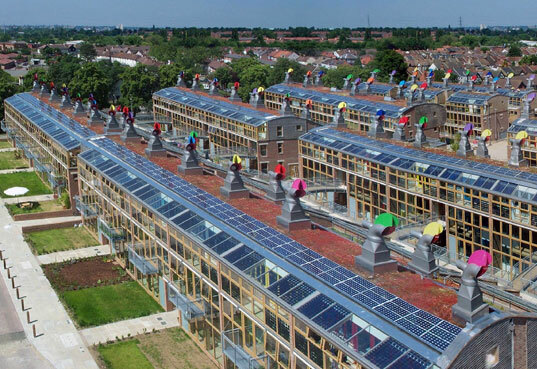 I couldn't have been further from the mark: ZED factory's Bill Dunster's project called BedZED (Beddington Zero Energy Development) – UK's first large-scale mixed use sustainable community – could not be more different to what I imagined. It appears to have found the right balance between sustainability and viability, and, completed in 2002 in the borough of Sutton (Southern London), BedZED is a highly original concept in which ordinary people live within their nature-friendly share of the earth's resources. Vous l'aurez compris, le nom même du projet «Beddington Zero Energy » a quelque chose d'utopique, pour ne pas dire purement commercial. Bien entendu, personne ne peut vivre sans émettre d'énergie. L'objectif de BedZED est donc davantage de réduire ces émissions, un objectif globalement atteint si l'on observe les statistiques. Grâce à des procédés architecturaux simples – les maisons sont exposées au sud et leur isolation optimale, l'air est réutilisé grâce à d'étranges cheminées nommées "windcowls" - BedZED a réduit de 81% sa consommation d'énergie pour le chauffage. Par ailleurs, la consommation d'électricité a diminué de 45% grâce aux panneaux solaires et autres cellules photovoltaïques. Le coût est amortissable sur le long terme, et force est de constater que ce n'est pas plus inesthétique que les guirlandes lumineuses qui fleurissent à Noël. Instead of providing you with tons of architectural and technical details (this may have something to do with my inability to do so...), I am going to explain how people live 'in this sustainable community', and look at whether it actually works. Car sharing, a water treatment system using plants, four dustbins per flat, communal shops for 30 people, pooling of washing machines, a garden and a veranda for each house : the BedZED project is crammed with simple, intriguing and nature-friendly tricks. They are said to be efficient : let's see if it's true. Beddington 'Zero Energy'. Zero ? Really ? The truth is that nobody can live without using energy. It is inconceivable, and almost impossible to do so in today's society. But if the most important criteria to judge the sustainability of BedZED is figures, then it must be said, the project is impressive. 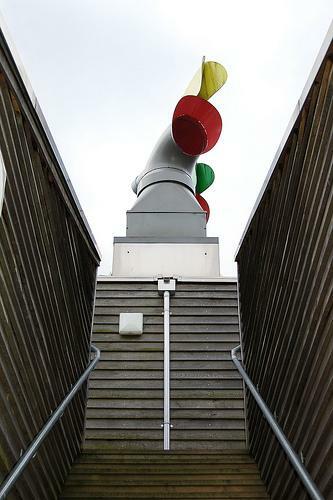 With clever architectural processes – south facing houses, super-insulation and these strange chimney stacks named 'wind cowls', which use wind to supply the buildings with fresh air without using any electricity – BedZED has reduced its energy consumption for heating by 81%. Moreover, as all houses' roofs are covered with solar panels and windows by photovoltaic cells, electricity use has been reduced by 45%. And to be honest, it is not so unsightly, at least no uglier than the fairy lights we put all over our houses for Christmas. But what surprised me most was the unbelievably efficient urban drainage system. Green roofs are planted with sedum, a permeable paving type of plant which allows water to be reused through a soakaway ditch. Combined with dual flush toilets, low flow taps, aerated showers and water efficient washing machines, it substantially reduces mains water use. Simple but efficient. BedZED's engineers chose to place a particular focus on the sorting of household-waste. Every home incorporates a colour coded, segregated under-sink bin. The colours relate to the type of waste – green for compostable vegan waste, two grey sections - for glass, plastics, paper and tins and brown for non-recyclables. This is not a ground-breaking discovery – most of French houses are already separating the rubbish – but it pays off. all residents can enjoy their own garden. The fact that people are supposed to live in perfect harmony is highly emphasized by BedZED's founders. I don't know if 'harmony' is the most appropriate word, but the least one can say is that they really live in 'community'. Interactions between residents through various activities are encouraged – transports, cooking, washing – as it helps in reducing energy consumption. 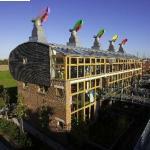 Indeed, an electric car club service was introduced, and in the beginning, BedZED residents were doing communal shops. Only imagine : buying pastas for 100 houses, 250 fillet steaks... 86% of BedZED residents buy organic food (reducing the use of oil-intensive chemicals) and 39% grow some of their own. These are not hippy hobbies, just environmental friendly habits. Equally novel: BedZED is a sort of giant Traid, the much-famous recycling fashion shop. When residents first moved to BedZED a swap shop was set up. Residents took items that they no longer wanted and swapped them with other residents for items that they did. However, clothes trade and communal shops are now a thing of the past, as even the best of intentions can fall by the wayside when faced with the issue of "practicality". And this is maybe my lasting overall impression from my trip to BedZED. There were a lot of exciting projects, which have been dropped. When I saw the admittedly run-down common dining room, which contains only 16 seats for at least 300 residents, I realised that very few people were still actually eating together. The sports pitch now more closely resembles an overgrown field, and the car park is filled with non-electric cars. This is hardly surprising, seeing as it took me 1 hour to get from Notting Hill to BedZED by public transports. If there is one essential thing that BedZED does not have, it is good public transport links – unless you like taking the tramway, then the DLR, the tube, and then the bus ! Other projects simply turned out to be unrealistic. This is the case of the 'green water' treatment system. Within giant tubs, little creatures and plants were taking a wicked delight in eating and cleaning all the wastes contained in used water, returning the cleansed 'green' water to the housing for toilet flushing. In this way, nature efficiently replacing toxic products. A marvellous innovation, truly, but simply not viable: it was just too expensive, and is now no longer in use. 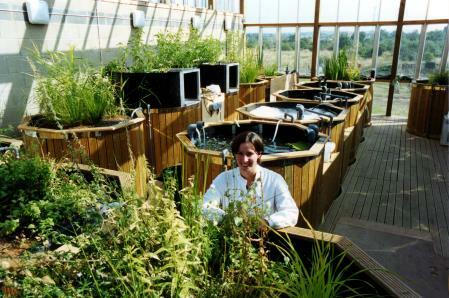 This is not a greenhouse, just BedZED's Green Water Treatment Plant. But it turned out unrealistic. Too bad. If everyone on the earth lived like the 'keenest' BedZED residents, then, the ecological footprint (the number of planet Earth we need to support humanity's lifestyle) would be reduced to the equivalent of 1,7 planets. Needless to say we (ie : 'normal' people like you and me) are very far from BedZED's sustainable lifestyle, and we are closer to needing the equivalent of 3 planets. But most of the residents' ecological footprint is 2.6 planets - better than nothing, for sure - but it proves that even in BedZED, everybody is not ready to yield to the pressure of impending environmental threats. Does this mean BedZED is a fail ? Definitely not. It just means that BedZED residents are people like you and me, they have a busy life and they just can't afford to use their bike only, or spending all their time in communal activities. It's a housing estate, not a Kibbutz! So lets just applaud them for what they are already doing because, as the irritating add goes: "every little helps". Open: 9.30am to 5.00pm, Monday to Friday, except bank holidays. Many thanks to PLD for all information regarding BedZED. Have a happât new year ! L'entrée est gratuite? Vraiment? Ils ont du changé leur pratique depuis. Je l'ai visité en Février et il était impossible de visiter par soi-même, visite guidée obligatoire à 20 Pounds.. Ce qui est hors de prix ! Et puis la visite guidée passe bien sous silences toutes les difficultés auxquelles BedZED est confronté aujourd'hui. Bref, un espèce d'éco-quartier Disney assez décevant. Comme L.Z je trouve l'idée bonne ,mais tellement utopique; l'homme est bien trop individualiste pour que cela fonctionne. Et en plus il adhère a une idée que lorsque cela l'arrange. Les idées de Charles Fourier sont encore vivantes et renaissent de leurs cendres ! Que vivent les utopies !!! Bravo Matthieu pour ces investigations. Cela commence tout simplement par le tri sélectif dans nos poubelles domestiques ! Ça a été un réel plaisir de te faire découvrir cet eco-quartier. Pour ma part, après un travail important en France, parcourir cette prouesse "architecturo-social" m'a permis de réaliser que le concept réver de tout architecte est encore loin de rentrer dans nos mœurs. La culture suédoise, ou plus généralement nordiste, s'en rapproche à petit pas, mais nos cultures, quelles soient française ou anglaise, ne nous permettent pas encore de démocratiser un tel mode de vie. Comme le dit si bien Matthieu, ce concept n'est pas qu'un quartier révolutionnaire au niveau de l'architecture, mais il est avant tout une prouesse sociale ! Le plaisir est de voir que de jeunes journalistes s'intéressent à de telles créations. Faire connaitre à nos entourages ce mode de vie "futuriste" nous permettra d'adopter chacun un petit peu d'eco-citoyenneté.